We believe that everyone should love what they eat, and our passion is creating great tasting gluten-free foods through the power of Ancient Grains. A tale of flour (and tasty food). Back in 2005, Georgia Hutton, a baker and foodie in Austin set out to create a better gluten-free flour blend for a friend with celiac disease. Her mission was to improve the taste, texture and nutrition of all the rice blends on the market. A bit of experimentation led her to sorghum, amaranth and teff — three Ancient Grains that happen to be completely gluten free. Eureka! Our blend was born. Georgia’s friend loved loved loved the blend so much she shared it with her physician, Erika Leakey. Erika agreed it was way too good to keep quiet and voila — they founded Gluten Free Kneads. They started making tasty, nutritious, gluten-free pizza crusts for restaurants and demand just kept growing as people realized you CAN enjoy grains AND be gluten free. A few years later, Austin-based tech executive Charlie Pace discovered that he was gluten intolerant. Out searching for great tasting gluten-free foods, he tried one of those pizzas in a local restaurant. He loved it so much that he left the bits and bytes behind in 2011 and made this delectable Ancient Grain formulation his life’s passion. He acquired Gluten Free Kneads and changed the name to Smart Flour Foods to reflect its broad potential…something everyone would love. Fast forward a few very short years and gluten-free, gluten-choosy, or just plain hungry fans can find Smart Flour in stores and restaurants across the country! Uncured pepperoni is our most popular pizza (for good reason). It’s made of primo ingredients — vegetarian-fed pork, hormone-free cheese and, of course, our signature gluten-free pizza crust. It’s a combination that stacks up for one salty, spicy, cheesy, darn-right yummy pizza. Smart Flour Pizza is amazingly delicious! My family and I absolutely loved both the Garden Margherita Pizza and the Uncured Pepperoni Pizza. We will definitely be trying a few more flavors in the future. The pizza bakes really well in the oven and I love the sauce they use on the pizzas. I also love that they pepperoni is uncured. The flavors are intense and taste incredibly fresh. 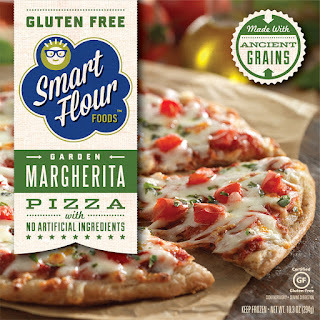 I also love that Smart Flour Pizza contains no artificial ingredients. I also a huge fan of ancient grains. I think they're easier to digest and much better for you. 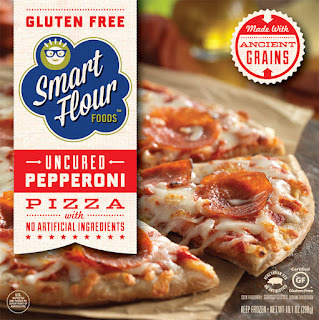 Smart Flour Pizza is wonderful and I highly recommend that everyone try it! Click HERE to find a store near you that sells Smart Flour! Click HERE to learn more about Smart Flour! Follow Smart Flour on social media!